Thermocouples are temperature sensors that take advantage of an interesting physical phenomenon discovered in 1821 by Thomas Seebeck. By placing two dissimilar metals together in a junction, Seebeck noticed that a potential difference (voltage) was present across the two different metals, which varied proportionally along with the temperature. The variable voltage output of a thermocouple enables it to be used for highly accurate temperature measurements over a wide range of temperatures. Unfortunately, for us artists and inventors, the output voltage from a thermocouple is very small; in the range of a few micro volts or less so it cannot be directly sent to the Stamp for measurement. However, Dallas/Maxim has created the DS2760, which is a microchip used to precisely monitor the voltage from a lithium ion battery. The DS2760 is also implemented to measure thermocouple output voltages. This sensor is available on the web at www.hvwtech.com. HVW provides the Thermocouple Kit DS2760, which includes the DS2760 soldered onto board, along with three different types of thermocouple elements. The DS2760 has many features which make it a logical choice for thermo coupling applications: one wire output to the stamp for data, large measure measurement range (0*C to 127*C), and low 2-90 milliamp power draw. This part does require a lengthy Basic program to convert the signal from the DS2760 to real world temperature numbers. You can find the code at HVW Tech. The LM34 temperature probe provides a linear voltage output proportional to the temperature. This small three-pin probe is easy to use because its output voltage can convert into useful Fahrenheit data, unlike thermocouples, which provide output based on the Kelvin scale. Although the LM34’s Fahrenheit scale requires less programming than the DS2760 Thermocouple temperature sensor, it lacks an analog to digital converter, so you must provide your own in order to send its data to the stamp. LM34s are available commercially from Parallax. 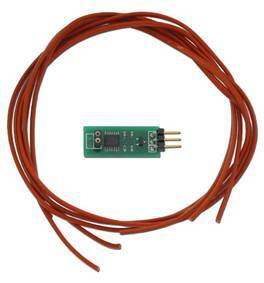 Temperature probes are valuable devices for sensing heat and cold changes over time. If you want an all-in-one temperature sensor and A/D converter, because additional parts are more complex than you desire the DS1620 digital thermometer may be a good choice. The DS1620 is an 8-pin integrated circuit that can act either as a thermometer or as a thermostat. In thermometer mode, the DS1620 will measure a temperature between -67*F and 257*F and report the value as a nine bit digital number. One important note about the digital output is that the bits are arranged in two's complement form. If you don't know what two's complement form is don't worry, a sample program is available for download from Parallax, or you can use this as a good opportunity to learn about two's compliment forms, a neat way to express positive and negative numbers with binary bits. The DS1620 can also operate independently in thermostat mode. In this configuration, the DS1620 is temporarily connected to the Stamp to set high and low temperature set points, and then when disconnected, the DS1620 will create an output signal when the temperature rises or falls above or below the set points. Hardware interface The DS1620 interfaces with controllers through a three-wire connection, consisting of a data input/output line (DQ), a synchronizing clock line (CLK) and a reset/select line (RST). Up until recently, humidity was very difficult to measure. Older systems required analog to digital interfaces, external circuitry which might require op-amps or oscillator circuitry, temperature compensation adjustments to calculate dew point, calibration against a known humidity source; and poor real-world response time. If you are interested in the details, see Tracy Allen's web site (EME Systems) for his discussion. Fortunately, a company named Sensirion has overcome the problems associated with the older humidity sensors. Sensirion manufactures the SHT71 and SHT75, which are small, four pins, fully calibrated, digital output humidity and temperature sensors. The SHTxx units can send their data serially to the Stamp and only require two lines for data and control. If you still demand more from your humidity sensor, the SHTxxs features a low power consumption (type. 30 µW), which requires no external components, and has a low cost.